Surreal doesn’t even begin to describe the events of Saturday July 25th, 2015 a date that had been circled on my calendar for a good, few months on account of a musical gathering called, Musik unter 15 Eichen or in other words, “Music Under 15 Oak Trees” located in… Melle! That’s right… this magical corner of Lower Saxony that has featured in my blogs many times before for playing host to concerts from Southside Johnny and the Asbury Jukes or more recently, the Billy Walton Band as well as the annual Light of Day shows that do so much to raise the awareness of Parkinson’s Disease. 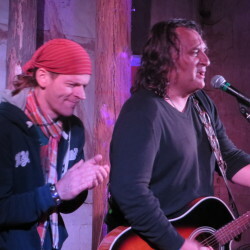 These events are mainly due to the fact that long-time New Jersey/Tri-state music fan, Reiner Borgmeyer is from this area of Germany and he has been paramount in making them happen, something for which we, his friends and fellow New Jersey/Tri-state music fans, will always be grateful for. Musik unter 15 Eichen was promoted as “Vol.2” and Plan A was to hold this as an open-air event on the farmland of host and presenter, Stefan Rodefeld, himself somewhat of an accomplished performer. 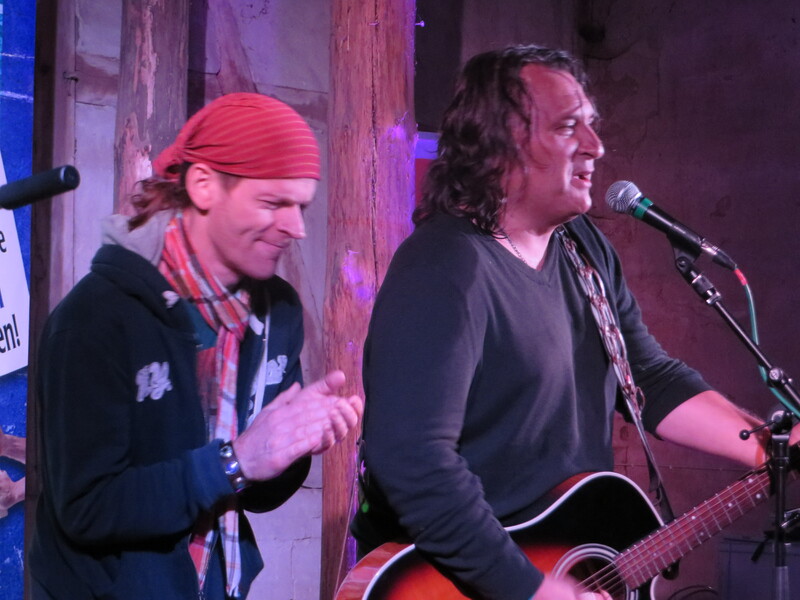 The artists billed to appear included, Joe D’Urso as part of a solo European tour he is currently on. Enter Murphy, stage right. And as the mother of all storms descended on the south west and northern regions of Germany resulting in traffic chaos, flooding and the cancelation of practically every outdoor event across the country, Plan B was implemented and the event was hastily re-routed to a barn – the sun may well have had its hat on but believe me, it *was* there in spirit. 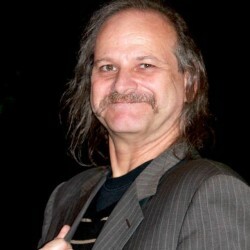 The day began with the incredibly sad and tragic news that Stone Caravan’s bass player of some 15 years, Louis DeMartino, “Mr Lou”, had passed away suddenly on Friday, July 24th 2015. 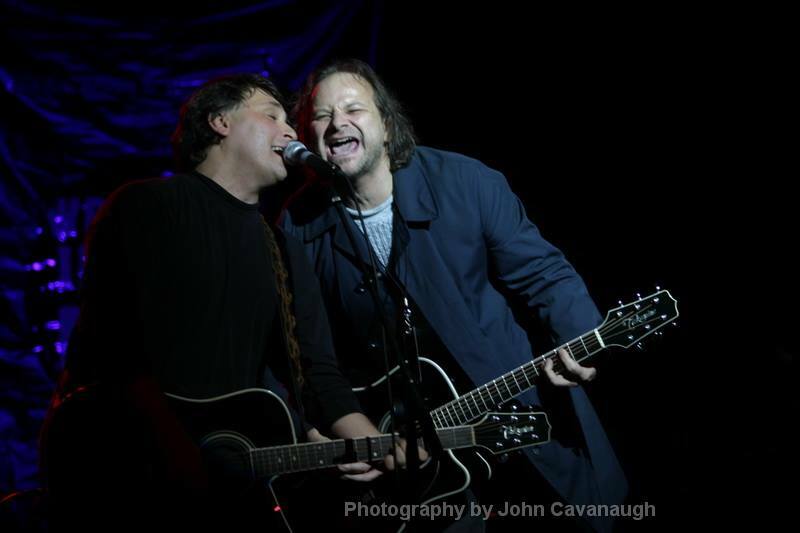 A mainstay of the Jersey Shore music scene, Mr Lou was, quite simply, Joe D’Urso’s left-hand-man whose character and presence on stage will be sorely missed by all who knew and loved him. If Joe had decided to return to the States, nobody would have blamed him for that and we would have sent our love and heartfelt condolences with him. But, he didn’t… and more to the point, it was never going to be an option. So, in spite of the severe weather warnings, we figured that if Joe could make it, then so could we. Arriving at the location was certainly a very wet and windy experience and I was glad I had packed my wellies – shame about the fleece, woolly hat, gloves, scarf and winter coat that I had left behind!! The plastic poncho rain shield became a parachute in reverse and took off rather than protected against the elements creating a hilarious scene reminiscent of something from a Carry On film. As I entered the barn on a gale-force gust of wind and rain, it was a bit like stepping into a dream sequence. The place was warm and dry and it was full of chatter from a great number of people of all ages already in situ eating and drinking which was a bit of a surprise really, considering the horrendous weather; there were bits and pieces of farm equipment stacked up against the outer walls together with outdoor furniture – presumably for Plan A… logs that served as bleachers, wooden beams supporting the roof, rustic stone floor underfoot, a beautifully built wooden stage that looked new plus lighting rigging and a soundboard… all of which was set against a gigantic poster backdrop promoting the “Taking Woodstock” movie and all its psychedelic shapes and colours associated from that particular era. Standing quietly in the corner observing everything and everyone, was a life-sized, sun-flower-eating stuffed camel with an equally stuffed peacock on its back! Somehow, it just felt right. Joe came into the barn ably assisted by his son, Guthrie who btw, did a grand job of looking after the merch. Britta and Reiner had also arrived by now and we watched, intently as Joe tuned-up his guitar. Nobody said anything but we sensed Joe’s pain as he stepped forward to the mic to begin his first performance since carrying the knowledge that something had changed forever. It was an emotionally-charged set that opened with one of the strongest versions of, No Surrender I have ever heard clearly reflecting the challenges of organising an open-air festival of music in Germany at this time of year! Joe kindly acknowledged Britta, Reiner and me as well as our friends, Carina and Karin who couldn’t make it. When Joe introduced us and dedicated Incident On 57th Street our way, he didn’t know that “Jane” is my middle name but it was a wonderful surprise and a much appreciated, poignant gesture from all of us. 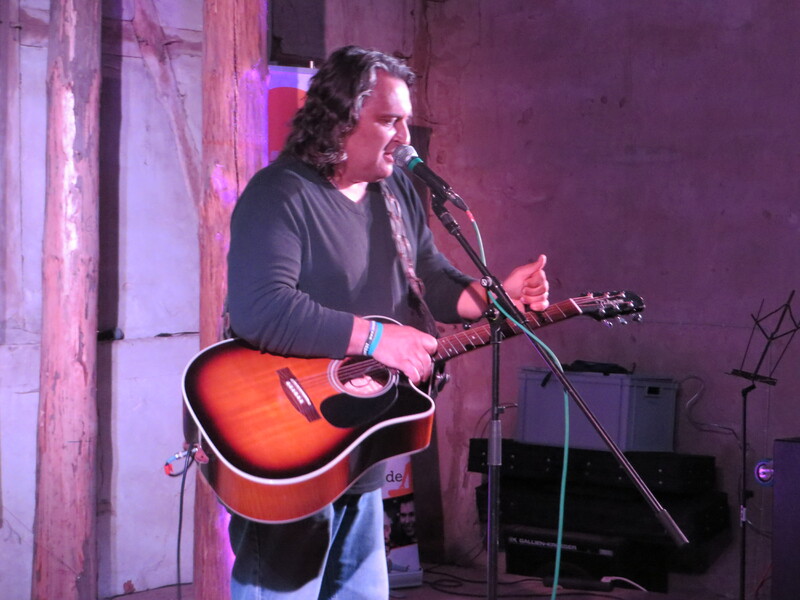 Other highlights for me were: Joe’s version of Willie Nile’s, One Guitar, his own song, Let It Go which he dedicated to Mr Lou, Wooden Heart which had a perfect German Backing Band singing the “muss i den…” bits. Never Missed You More told its own story and just as the set was coming to an all-too-early end, the barn doors blew open to reveal… Martin Praetorius aka: Man in the Red Van standing in the entrance en route to Denmark! 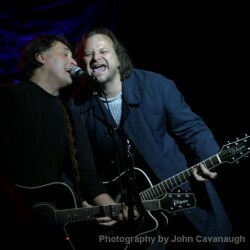 Martin joined Joe on stage and added some additional vocal support to, Twist and Shout – a barn-stormer if ever there was! 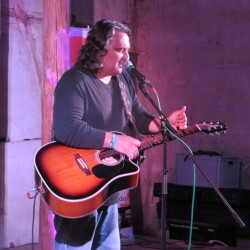 Joe’s set also included, Come Down Tonight, a really great song he wrote that tells the story of the revival of Asbury Park and when he left the barn, the rafters were still ringing to the sound of his well deserved, rapturous applause. After the show, Britta, Martin, Reiner and me hung with Joe for a bit reminiscing about Mr Lou, smiling at the infinite memories his legacy has given us, trying to get our heads round the way that social media had literally exploded with the news, hugging each other in place of words of condolence and generally just smiling quietly at the dreamlike situation we appeared to be in and how lucky we were to have shared what really was a truly, “magic moment” together. Thank you to Stefan for organising this wonderful evening, to Reiner for giving us the heads-up, to Britta and Martin for being there and to Joe for doing what he does best and delivering a powerful and passionate set that went above and beyond the call of duty on a night that would not have been lost in an apocalypse movie. Thank you of course, to Guthrie for looking after his dad. And to Mr Lou who will live forever in our hearts.